Hi ladies! Just a super quick post to show you my very quick Valentines Day manicure. I've been very busy these last few days with work and social events so I haven't had a chance to do much blog stuff or blog reading unfortunately. Haven't really had time to do much including sleep x) I also went for a job interview on Saturday for a 2nd job and was offered the position on the spot! WOOT! They were desperate what can I say haha. It's a casual nurse position mainly for the weekends so with my current fulltime job I'll be working 6-7 days a week soon. This means much less leisure time but enables me to save up for things a lot sooner! I'm not a big fan of Valentines Day as I think it's turned into such a cheesy holiday to give retailers an excuse to hawk unnecessary items to unwitting men and women in the name of "love". Love should be celebrated and appreciated EVERYDAY not just when Hallmark tells us too! It didn't stop me from still doing a Valentines mani or planning a nice Thai dinner tonight for me and the boy though lol. I was planning to do a soft, pinky manicure as the boy prefers my nails simple but as usual I got carried away! I started off with 2 coats of Borghese Bellissima Rose. 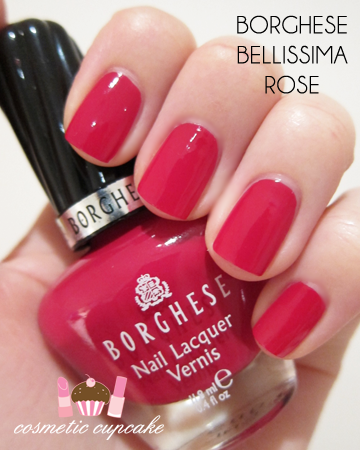 Bellissima Rose is a gorgeous dark berry pink almost red creme. It's a gorgeous colour! The brush was fantastic to use and meant I had very minimal cleanup. The polish is very opaque and 1 thick coat would be sufficient but I did 2. Dry time was good and the polish dried to a very glossy finish. 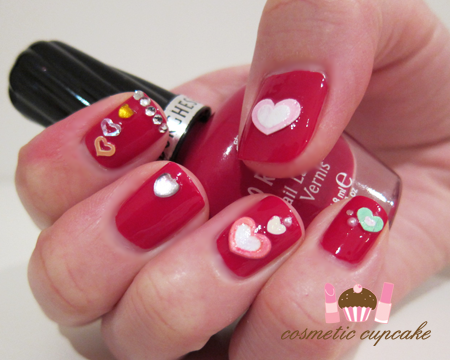 I then added heart nail stickers, rhinestones, half pearls and dazzlings to complete the look. I hope you all have a lovely Valentines Day! Don't forget to enter My Big Birthday Giveaway! I just love your nails! So beautiful! Question-did you say that you got your gradient manicure kit in Hong Kong? My husband is going there in March and I have a list started of all the great beauty products that I want him to get for me!! If you think there are some 'must-haves' that I should add to my list, please tell me! 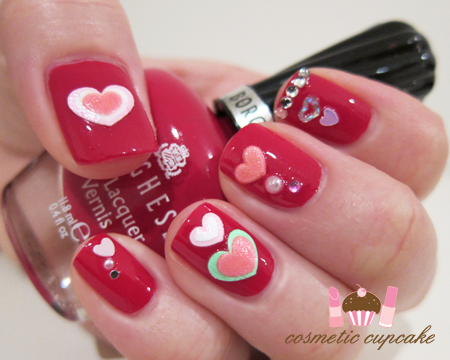 Very cute mani. I don't get into Valentine's day for similar reasons. I love the heart stickers! ´Chelle, I agree about this cheesy comercial holiday. We don´t celebrate it here in Brazil(Our correspondent to Valentine´s in on june 12), but as we´re global now, we end up participating somehow. Your mani is awesome. I loved the polish even without the art. But when you put the little hearts, it got to me. Congrats! You´re very creative. Enjoy your Thai dinner! Wow! that is an amazing shade of red & golly gorgeous decorations! So cute and what a lovely color. @Christina: Thank you my dear! I'm kicking myself for not buying more of these nail stickers when I was in HK. They were a great price too doh! 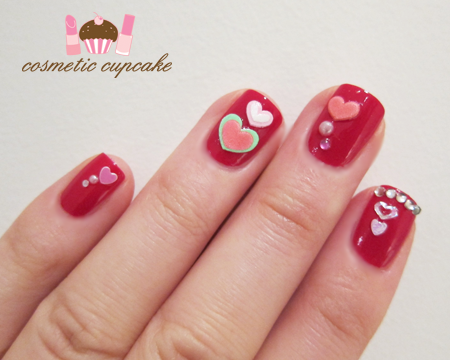 I can't wait to see your Vday mani! @MissStarshiny: Glad you like it! @meredith: Thanks Meredith =) Yes I got my gradient kit from Hong Kong! You can get them from Log On or Colour Mix stores. Tell him to check out Sasa, Mannings, Bonjour! @Chris: I'm not anti-valentines but I just don't get the commercialism. It's such a waste of money! @Tara: They're my favourite part of the mani I think. They felt really nice too! Lol. @Liih Monteiro: I'm so glad you liked it! @Freshie: I'm kicking myself for not buying more of these hearts when I was in HK. I just hope the store still sells them when I got back next! @sugar sugar: Thanks hun =) Hope you had a great Valentines! @FerahFeza: It's a gorgeous dark pink/red and it's great that it applied so nicely too! Definitely try and get your hands on it if you can. @Oreleona: It definitely should be so I tell my boyfriend lol. @melanieeatsghosts: Thanks Melanie! I'm not surprised you like the colour, I love it too! @PensivePenumbra: Great to hear you had a lovely Valentines =) Thank you so much for your sweet comment! I didn't really know what to do so just used the hearts and went from there! @Mez: LOL they are pretty neat huh! I'll be on the look out for them when I'm in HK next for ya =D thank you for adding me to your blogroll hun!